Want to be Part of The Global Hamlet? 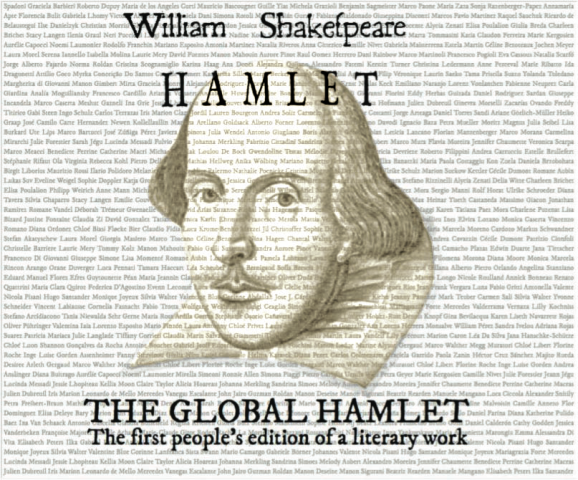 The Global Hamlet Project will officially launch in April 2015 and you’ll be reading about it here on Shakespeare in LA in the coming months. What is The Global Hamlet? Born from the concept of collective intelligence, The Global Hamlet (defined “groundbreaking” by Shakespearean actor Ben Crystal and “wonderful” by Michael Dobson, director of the Shakespeare Institute at Stratford-upon-Avon) will be the first people’s edition of a literary work ever made; it will be the whole world translating, annotating and illustrating Shakespeare’s Hamlet in many languages through the internet. Project participants will be invited to help annotate Shakespeare’s Hamlet not only with text, but also with traditional images and videos of the play, and to illustrate its scenes through drawings and clips. Everyone can participate, under the supervision of expert Shakespearean editors, with the intent to create from the ground up the highest quality edition of Hamlet written by the people. There will be many ways to become part of the project. The first is for participants to submit a recording of themselves saying “I am Hamlet.” Easy, right? Men, women, young and old, are all invited to participate in this video. You can feel free to also say a few lines from the “To Be or not To Be” monologue. The only requirement when you make your recording is that you do so facing the camera, with both face and shoulders being visible. (Camera shot is shoulders up). Send your AVI file to Nefeli Misuraca at n.misuraca@globalhamlet.org. The Global Hamlet Project will then combine all of these recordings into a video montage to represent that this is a people’s version of Hamlet and to get people excited about it. Many European institutions are already involved, including: Westminster University, The Shakespeare Institute in Stratford-upon-Avon, University College London, Universiteit Utrecht, Paris College of Art, Université de Le Havre, Universidad de Murcia, Universidad Autónoma de Madrid, Universitat Pompeu Fabra de Barcelona, Universitat de Valencia, Universidade do Minho, Universidade do Porto, Fundación Shakespeare Argentina, while international major publishing houses have already signed contracts to publish the people’s editions: Editorial Anagrama in Spain and South America, La Table Ronde (an imprint of Gallimard) in France, Feltrinelli Editore in Italy, Athenaeum Uitgeverij in the Netherlands. The project is part of a larger intent to create a collective library of living books, books that transform themselves endlessly through time thanks to the intervention of the whole community. The team includes experts, Ph.D.s, Shakespeare lovers, people passionate with literature and computer geeks. Diversity is the project’s strength, in fact, GHP wants to attract the largest public possible – and the users will be able to send their own texts, comments, images, even film, to be included in what will become a truly encyclopedic archive. Stay tuned for more about The Global Hamlet. You can also find out more about the project on Facebook and Twitter. I am supposed to interview them today. I’m looking forward to it. Have a great interview, Deborah. I look forward to reading your article.